Though the FCC adopted its proposed rules regarding net neutrality on February 26, 2015, the actual “report and order” including the technical details of what the commission approved was not released publicly until March 12, 2015. 1. The open Internet drives the American economy and serves, every day, as a critical tool for America’s citizens to conduct commerce, communicate, educate, entertain, and engage in the world around them. The benefits of an open Internet are undisputed. But it must remain open: open for commerce, innovation, and speech; open for consumers and for the innovation created by applications developers and content companies; and open for expansion and investment by America’s broadband providers. For over a decade, the Commission has been committed to protecting and promoting an open Internet. 2. Four years ago, the Commission adopted open Internet rules to protect and promote the “virtuous cycle” that drives innovation and investment on the Internet—both at the “edges” of the network, as well as in the network itself. In the years that those rules were in place, significant investment and groundbreaking innovation continued to define the broadband marketplace. For example, according to US Telecom, broadband providers invested $212 billion in the three years following adoption of the rules—from 2011 to 2013—more than in any three year period since 2002. 4. The lesson of this period, and the overwhelming consensus on the record, is that carefully-tailored rules to protect Internet openness will allow investment and innovation to continue to flourish. Consistent with that experience and the record built in this proceeding, today we adopt carefully-tailored rules that would prevent specific practices we know are harmful to Internet openness—blocking, throttling, and paid prioritization—as well as a strong standard of conduct designed to prevent the deployment of new practices that would harm Internet openness. We also enhance our transparency rule to ensure that consumers are fully informed as to whether the services they purchase are delivering what they expect. 5. Carefully-tailored rules need a strong legal foundation to survive and thrive. Today, we provide that foundation by grounding our open Internet rules in multiple sources of legal authority—including both section 706 of the Telecommunications Act and Title II of the Communications Act. Moreover, we concurrently exercise the Commission’s forbearance authority to forbear from application of 27 provisions of Title II of the Communications Act, and over 700 Commission rules and regulations. This is a Title II tailored for the 21st century, and consistent with the “light-touch” regulatory framework that has facilitated the tremendous investment and innovation on the Internet. We expressly eschew the future use of prescriptive, industry-wide rate regulation. Under this approach, consumers can continue to continue to enjoy the benefits of a platform that affords them unprecedented access to hundreds of millions of consumers across the country and around the world, and network operators can continue to reap the benefits of their investments. 6. Informed by the views of nearly 4 million commenters, our staff-led roundtables, numerous ex parte presentations, meetings with individual Commissioners and staff, and more, our decision today—once and for all—puts into place strong, sustainable rules, grounded in multiple sources of our legal authority, to ensure that Americans reap the economic, social, and civic benefits of an open Internet today and into the future. 8. Threats to Internet openness remain today. The record reflects that broadband providers hold all the tools necessary to deceive consumers, degrade content, or disfavor the content that they don’t like. The 2010 rules helped to deter such conduct while they were in effect. But, as Verizon frankly told the court at oral argument, but for the 2010 rules, it would be exploring agreements to charge certain content providers for priority service. Indeed, the wireless industry had a well-established record of trying to keep applications within a carrier-controlled “walled garden” in the early days of mobile applications. That specific practice ended when Internet Protocol (IP) created the opportunity to leap the wall. But the Commission has continued to hear concerns about other broadband provider practices involving blocking or degrading third-party applications. 9. Emerging Internet trends since 2010 give us more, not less, cause for concern about such threats. First, mobile broadband networks have massively expanded since 2010. They are faster, more broadly deployed, more widely used, and more technologically advanced. At the end of 2010, there were about 70,000 devices in the U.S. that had LTE wireless connections. Today, there are more than 127 million. We welcome this tremendous investment and innovation in the mobile marketplace. With carefully-tailored rules in place, that investment can continue to flourish and consumers can continue to enjoy unfettered access to the Internet over their mobile broadband connections. Indeed, mobile broadband is becoming an increasingly important pathway to the Internet independent of any fixed broadband connections consumers may have, given that mobile broadband is not a full substitute for fixed broadband connections. And consumers must be protected, for example from mobile commercial practices masquerading as “reasonable network management.” Second, and critically, the growth of online streaming video services has spurred further evolution of the Internet. Currently, video is the dominant form of traffic on the Internet. These video services directly confront the video businesses of the very companies that supply them broadband access to their customers. 10. 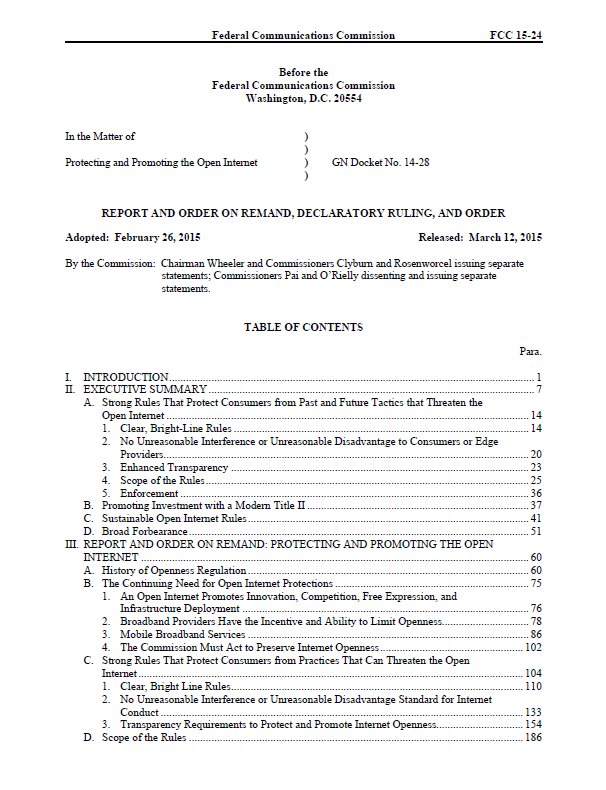 The Commission, in its May Notice of Proposed Rulemaking, asked a fundamental question: “What is the right public policy to ensure that the Internet remains open?” It proposed to enhance the transparency rule, and follow the Verizon court’s blueprint by relying on section 706 to adopt a no-blocking rule and a requirement that broadband providers engage in “commercially reasonable” practices. The Commission also asked about whether it should adopt other bright-line rules or different standards using other sources of Commission authority, including Title II. And if Title II were to apply, the Commission asked about how it should exercise its authority to forbear from Title II obligations. It asked whether mobile services should also be classified under Title II. 11. Three overarching objectives have guided us in answering these questions, based on the vast record before the Commission: America needs more broadband, better broadband, and open broadband networks. These goals are mutually reinforcing, not mutually exclusive. Without an open Internet, there would be less broadband investment and deployment. And, as discussed further below, all three are furthered through the open Internet rules and balanced regulatory framework we adopt today. The reason for [an administrative agency’s] existence is that it is expected to bring to its task greater familiarity with the subject than legislators, dealing with many subjects, can have. But its knowledge is rarely complete, and it must always learn the frequently clashing viewpoints of those whom its regulations will affect. 13. Congress could not have imagined when it enacted the APA almost seventy years ago that the day would come when nearly 4 million Americans would exercise their right to comment on a proposed rulemaking. But that is what has happened in this proceeding and it is a good thing. The Commission has listened and it has learned. Its expertise has been strengthened. Public input has “improve[d] the quality of agency rulemaking by ensuring that agency regulations will be ‘tested by exposure to diverse public comment.’” There is general consensus in the record on the need for the Commission to provide certainty with clear, enforceable rules. There is also general consensus on the need to have such rules. Today the Commission, informed by all of those views, makes a decision grounded in the record. The Commission has considered the arguments, data, and input provided by the commenters, even if not in agreement with the particulars of this Order; that public input has created a robust record, enabling the Commission to adopt new rules that are clear and sustainable.